With vast experience and knowledge we are involved in offering a premium quality range of Air Suction Filter. These are developed using superior quality raw material in compliance with the international quality standards. 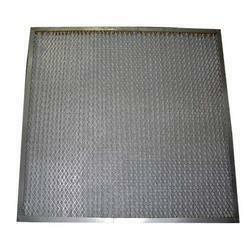 These are extensively used for air separation, air filtration and many more. Additionally, we also assure safe and timely delivery of our products. With the support of our techno-savvy group, we are able to offer the Axial Flow Fan. The offered flow fan is manufactured using optimum grade steel under the supervision of experts in order to establish proper coordination in between between the volume of air flow and power consumption. Besides this, the offered Axial Flow Fan is quality approved as per the guidelines laid by the industry for maximum efficiency at a lesser H.P. The casing of fan is built from mild steel/stainless steel sheets with accurate sizes for a durable finish. Our firm is specialized in offering of filters, engaged in offering superior quality Aluminum Air Suction Filters. It is used to filter air in construction equipments, earth moving equipments, transmission devices, gas turbines etc. The offered air filter is manufactured utilizing premium grade raw material with the help of latest technology in adherence with the set global standards. Our offered filter is made available in different technical specifications as per the demands of clients.